The Democrats are looking a bit like the boy who cried wolf. They have seen threats to all of the social safety net programs (Social Security, Medicare & Medicaid) in every campaign and Republican proposal. The real problem is that when someone comes along with a plan that will end these programs, they have less credibility. The real wolf has finally arrived. Paul Ryan, you are that wolf. Congressman Ryan’s plan offers a strange study in contradiction. It is bold and honest. It is equally timid and dishonest. This plan shows some bravery in that he does talk about some of the entitlements – the so called “third rail” of politics – Social Security and Medicare – two incredibly popular programs. These programs are so popular that even members of the Tea Party like it – remember their signs that read “Government stay away from my Medicare!” Granted, these signs miss the point but people like knowing that when they get old they will be cared for. So yes, Mr. Ryan, kudos for talking about them. The problem is that the costs associated with our health care system are spiraling out of control. In this area, Congressman Ryan and I agree but we soon part ways when his plan says “At the heart of this problem is the Federal tax exclusion for employer-provided health coverage.” His solution is to give people $2,300/year for individuals and $5,700/yr for families in the form of a tax refund – this is not for people who will be enrolled in Medicare or Medicaid but speaks to the point about lowering medical costs – this plan would require people to be responsible for any costs above the tax refund amount. I challenge anyone to find decent health insurance for that. The cowardice does not end there; there is one entitlement that this plan leaves alone and that is defense spending. Nowhere in this plan does he mention the military. The “Roadmap for America’s future” is both really honest and really not. It claims to protect and preserve Social Security, Medicare and Medicaid while simultaneously blaming them for many problems the county faces. 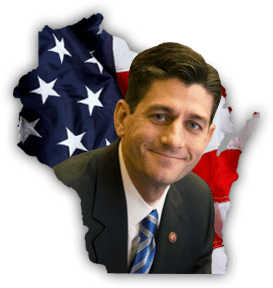 Congressman Ryan blames the New Deal and Great Society programs for causing government to control people’s lives, destroying the American character, removing any incentive for innovation and killing the entrepreneurial spirit that has defined us since our founding. This is the fundamental difference between Republicans and Democrats – and is the reason the Democrats have been crying wolf for so long. Republicans have been trying to dismantle these programs since they were enacted. Congressman Ryan doesn’t beat around the bush on this topic. He comes right out and blames these programs for destroying America’s character. This idea is repeated often throughout the introduction. It would take pages and pages to cite every example of this intent. In one section he states: “Americans have been lured (emphasis added) into viewing the government – more than themselves, their families, their communities their faith – as their main source of support.” He says in another section that “More ruinous in the long run in the extent to which the “safety net” has come to enmesh more and more Americans – reaching into middle incomes and higher – so that growing numbers have come to rely on government, not themselves, for growing shares of their income and assets. By this means, the government increasingly dictates how Americans live their lives.” That last bit is particularly interesting when you remember that some Republicans in Congress have proposed making welfare recipients take drug tests. There is a clear irony there. I welcome the opportunity to have the conversation about what we want our government to do and be. I believe government exists so that we can do the things collectively that we cannot do individually. When Congressman Ryan blames the social safety net for destroying our innovative nature, he shows just how vast the ideological gulf is between the right and the left. When you look at growing economies and societies – Asia, I am looking at you – you see countries investing in their people. I see a great parallel between what makes employees stay with company (hint: it’s not money) and how countries see their people. Companies and organizations that see their employees as their greatest asset treat them better – give them the tools and resources to do their job. Similarly, countries that invest in their children’s education, for example, are going to be the future super powers. I am a Democrat. I do not want Social Security, Medicare and Medicaid to be turned into voucher programs: that’s the antithesis of what they were meant to be. However, if Congressman Ryan’s plan leads to a real, productive conversation about these programs and the role the federal government should play, I welcome this as an entrée into that. If this is the ending point, though I think ending these programs, which are infinitely more popular than any politician right now, it would not show the world that we are recapturing our entrepreneurial spirit but that we are reneging on the promises we made to our own people. A number of people (Churchill, Ghandi, Truman, others) that “The measure of a society is the way it treats its weakest members.” We should remember that as we move forward. This entry was posted in Political thoughts, Random and tagged barack obama, budget, campaigns, congress, congressman paul ryan, cry wolf, deficit, democracy, democrats, great society, health care, medicaid, medicare, new deal, Political thoughts, recession, republican party, republicans, social security on April 28, 2011 by Alyson Chadwick.